The man…the music…celebrating Eric Clapton and his legendary Unplugged Concert. 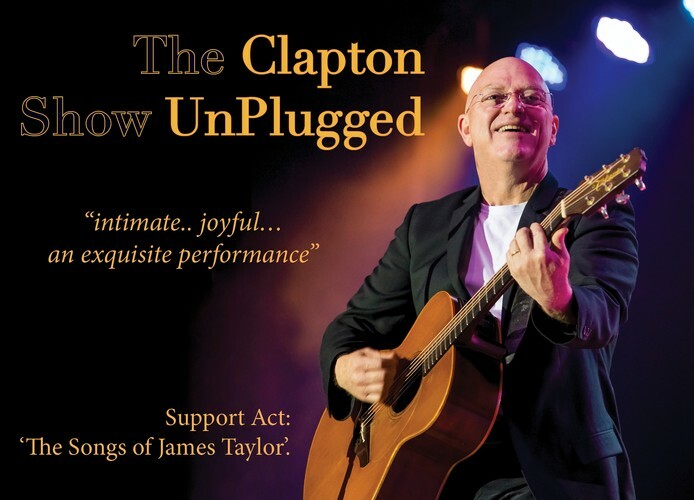 The Clapton Unplugged Show features the inspired vocals and guitar playing of Mark Shelley, who, with his long term band, respectfully recreates the magic of Eric Clapton and his legendary Unplugged Concert. ‘Layla’, ‘Signe’, ‘Before You Accuse Me’, ‘Running on Faith’, ‘Tears In Heaven’, ‘Wonderful Tonight’, ‘I Shot the Sheriff’ and more. Eric Clapton’s career has spanned over 6 decades. Lauded as being the greatest guitarist of all time, his roots are firmly and obviously embedded in the blues tradition of which he remains both a student and visionary. In his unforgettable ‘Unplugged’ Concert, Clapton paid homage and respect to his roots and those fellow legends that influenced his playing so significantly. The ensuing album release won 3 Grammy Awards and sold in excess of 26 million copies worldwide. Support Act: The Songs of James Taylor – the consummate singer-songwriter. You will lose yourself in this intimate performance of some of James Taylor’s greatest hits ‘Fire & Rain,’ ‘Carolina,’ ‘Sweet Baby James,’ and more.